Do you want to learn about music? Buttons & Bows love music and will help you learn about it. The first three notes are called DO-RE-MI in Solfege music language. You can go up the scale from DO to DO! And then you can go back down! DO-RE-MI-FA-SO-LA-TI-DO! DO-TI-LA-SO-FA-MI-RE-DO.This “mountain” shows the “DO to DO” in the “C” scale. It is the easiest scale on the piano because it uses all white keys! A, B, C, D, E, F, G! Stop! If you go higher, then you start on A again. There’s no “H” in music! And there’s no “Z” either. Just A, B, C, D, E, F, G! Isn’t that easy? But in the “Key of C”, the “C” scale is used which goes: C-D-E-F-G-A-B-C. When you sing from “C” to “C”, or from “DO to DO” in the Solfege method, you climb an octave or 8 notes. You could also just sing or play 1-2-3 as shown on the Solfege mountain above. Below shows where these notes are located on a piano keyboard. 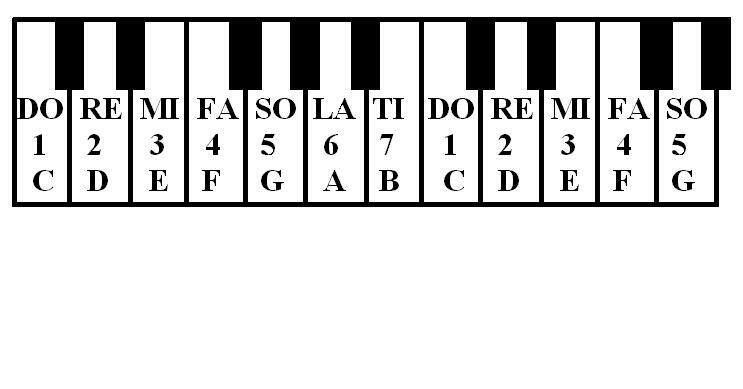 You can easily play an octave on the piano using the chart below as a guide. Uh-oh! There are 8 notes in the octave and you only have five fingers on one hand. For beginners, you can use two hands to play an octave. That would give you ten fingers. So don’t use your thumbs. Then you have eight fingers for eight keys or notes! Put your left pinkie on the left, lower “C” and the right pinkie on the right, higher “C” and one finger on each key in between. Remember you’re not using thumbs in thus. When you get more experienced you can play an octave with one hand! If you play piano, you will use your fingers to play! Each finger is called by a number: 1-5. These numbers are often written on piano music to show which finger should be used. EASY! HOMEWORK: Parents, have children tap both thumbs alone 8x on their lap or table at same time. Repeat exercise with pointers, then middle fingers, then ring fingers, then pinkies. Use the beat of a keyboard if possible. Start slowly, then increase tempo. This exercise increases flexibility of fingers and will help to instill rhythm.